WASHINGTON — William Barr, President Donald Trump's nominee to be the next attorney general, once warned of a lack of "political supervision" at the Justice Department that he said gave too much leeway to career prosecutors and made it "very easy for prosecutors to go hunting for scalps." Barr, who will testify before the Senate Judiciary Committee on Tuesday, told an interviewer during compilation of an oral history of the George H.W. Bush administration in 2001 that "the idea that the Department of Justice has to be independent" had gained ground following the Watergate scandal and risked going too far. 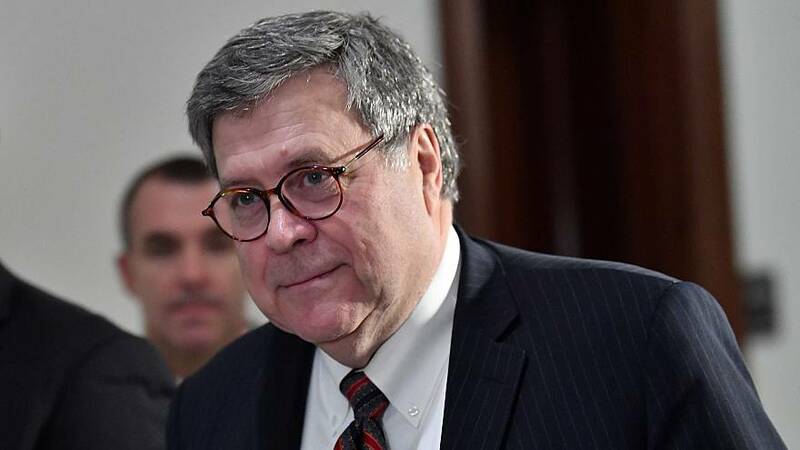 Barr had served as the first President Bush's attorney general from 1991 to 1993 and warned that it was "very destructive to personal liberty" to discourage political officials from reviewing specific cases pursued by the Justice Department. "I have come to feel that political supervision of the Department is very important. Politically responsible people," Barr said. "Someone ultimately has to answer to the political process." The newly unearthed comments could add to Democrats' concerns that Trump may be seeking an attorney general who would actively protect him from special counsel Robert Mueller's investigation into Russian interference in the 2016 election. Trump had long faulted former Attorney General Jeff Sessions, whom he ousted in November, for recusing himself from the Russia probe rather than retaining direct control. The attorney general, along with U.S. attorneys and senior Justice Department leaders, are political appointees chosen by the president. But the vast majority of federal prosecutors are career employees who serve regardless of who occupies the Oval Office, and tradition dictates that the Justice Department should operate independently of White House interference in determining which cases to pursue. In the Trump era, that issue has come to a head over the appointment of Mueller by Deputy Attorney General Rod Rosenstein to be a special counsel to look into Russia's meddling and potential Trump campaign collusion. Special counsels are typically appointed when a conflict of interest prevents regular prosecutors from acting impartially. In the oral history, compiled in 2001 by the University of Virginia's Miller Center for Public Affairs, Barr also spoke fervently about his opposition to the independent counsel law, enacted after Watergate to enable impartial investigations into top government officials such as the president. Barr said that system took away political accountability and gave the special prosecutor "a single focus." "So you almost remove any perspective or resource constraint on that person," Barr said. "No resource constraint, single perspective, a political environment where you're almost driven to find something or else you've wasted — to justify your existence. And no ultimate accountability." Although the law that Barr was criticizing is no longer in effect, it was replaced by a system that continues to face some of the same criticisms leveled by Barr and others. In 1999, the independent counsel law expired and was replaced by regulations that allow the attorney general to appoint an ad-hoc special counsel when he or she sees fit. Neal Katyal, the former acting U.S. solicitor general who wrote the special counsel regulations during the Clinton administration, said the new process does address some of the critiques voiced by Barr and others. Whereas the special prosecutor's office before 1999 erred on the side of independence, the new process makes special counsels ultimately accountable to the attorney general. It also gives the attorney general the authority to set the special counsel's budget, which can effectively limit the scale of an investigation. Still, many attorneys have continued to fault the current process for giving the special counsel a singular focus — what the regulations refer to as a "specific factual statement of the matter to be investigated." The concern is that as a result, special counsels feel compelled to find those crimes, rather than follow the facts where they lead, to avoid the perception they wasted taxpayer money on a fruitless endeavor. "It's a fair question for senators to ask Barr: Do the same criticisms apply?" Katyal said. The Justice Department didn't immediately respond to a request for comment. But in a 1999 congressional hearing about whether to re-authorize the old independent counsel law, Barr said he was against it but believes that "there are cases" when the attorney general should bring in someone from the outside to supervise a case. "The political process will dictate when that's appropriate," Barr said. And in his written testimony for his confirmation hearing Tuesday, Barr says it is "vitally important" that the current special counsel, Mueller, be allowed to finish his investigation. He also said the public and Congress should be informed of its results. "My goal will be to provide as much transparency as I can consistent with the law," Barr wrote. In the oral history, Barr's comments about the special prosecutor are followed by several redacted lines in the transcript of his oral history. It's unclear why they were redacted, but the ground rules for the oral history provided that Barr was allowed to edit his remarks before they were made public.